For the flyfisherman, successfully catching fish is the result of an orchestrated series of elements. Any of which, when flawed, may result in a glitch to our well-laid plans. Our equipment must be chosen carefully, the water approached with reason, and our presentations appropriate for the conditions. Strikes must be detected, hooks timely set, and fish tactfully played to the net. In any single element, a number of variables exist which may change the complexion of a given situation and shift the advantage back to the fish if not addressed by the angler. Considering these factors, none may be more critical than the hook-set. It's the moment of truth! There is a very brief moment when everything has come together, and a fish will be hooked, or missed and irretrievably lost. The type of set we use will vary with the presentation, but timing is all-important, regardless of the method. Many anglers become proficient using the techniques they employ most often, but struggle with the lesser used, and wonder why they are missing fish. 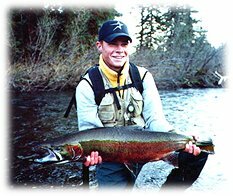 One such situation occurs while fishing streamers; and this seems odd because fish take a streamer with such vigor that they should hook themselves every time; unfortunately they don't. The problem is, that while fishing streamers, we commonly use a hook-set that is more appropriate for nymphing. It's the reflexive jerk. Snap the rod up and back using the shoulder, arm and wrist. Instead of setting streamers with the Jerk Set - we should use the Strip Set. On numerous occasions I have observed fish take an artificial fly, then spit it out almost immediately - its instinct as well as conditioning, and after years of natural feeding, a fish may only need one bite to realize the artificial is not a natural. The problem with the Jerk Set is that it gives a fish the necessary time to make this realization and get rid of our fly before the set is accomplished. When we jerk the rod up, and or back, it appears that we are positively moving the line and fly toward us, thus setting the hook; but in reality, much of our movement and energy is lost causing a momentary slack in the line. The initial energy we apply will be used to break the surface tension of the water and will be evident by the bend of the rod before the line begins to move. Then, as the rod progresses in an upward direction, loading will continue until the stored energy is sufficient to overcome whatever resistance is acting upon the line, and eventually, the fly will move with whatever energy is left. In contrast, the Strip-Set does not waste energy loading the rod, but rather, directs it at moving the fly. While fishing streamers, the rod will typically be held in a low position with the tip near the water, and the free hand will strip line through the rod hand. With the strip set; when a strike is detected, the angler will quickly strip more line while maintaining the low rod profile. In most instances, resistance will be immediately felt, and the actual hook-set will be accomplished using the stripping hand. Because the rod tip and line are pointed directly at the fish, minimal slack is present, and no energy is wasted on loading the rod. The stripping hand is in direct contact with the fish, and the appropriate pressure is more accurately delivered to the hook by the angler's feel of the line. Once the hook is set, the angler can then raise the rod tip to the desired position for fighting the fish.